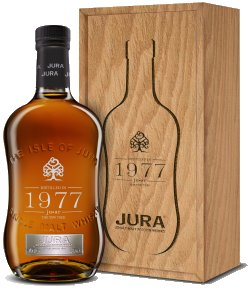 Jura Distillery has added a new limited-edition vintage to it’s collection – The 1977. This vintage has been given the name “Juar” Gaelic for the Yew Tree which at one time sprawled over the whole island. Jura Distillery Manager, Willie Cochrane said “The 1977 is a perfect mix of amber and gold shades, a quality that is only achieved through age. Complemented by an enticing scent and soft fruit flavours, Juar is a real treat for all Whisky lovers”. This release was matured in three first fill Bourbon Casks and then for it’s last 12 months is matures in a fine ruby port pipe. each of the 498 bottles will be presented in a solid oak box, crafted by John Galvin, a Scottish based cabinet maker. Check out Jura’s website to get more information on their excellent expressions available and about visiting Jura and the new Distillery visitor centre. Nose…Slight sweet oak, mixed exotic fruits, mild pepper note, quite complex. Taste…Runny toffee, mouth coating, almonds, ginger spice, soft fruits (peach, apricot, plums, kiwi, passion and ripe pears) mouth watering and delicate. Finish…Medium to long finish with spicy ginger and soft fruits lingering gently on the palate. Nose…Tangerines and peaches, peach melba yogurt, lavender, polish, fresh linen, vanilla toffee. Taste…Iced peaches, peach sorbet, pineapple turnover, sugar dusting, gooseberries and grapes. Finish…Juicy and full of ripe soft fruit, a delight. This is a delicate and delightful dram and is to be sipped slowly at a special occasion as at £600.00 for a 70cl bottle it is certainly not cheap. 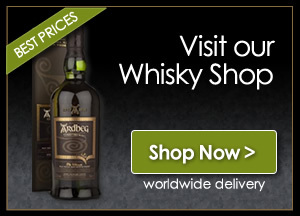 The Whisky Boys would highly recommend that if any of our readers get a chance to taste this Single Malt you should grab it with both hands. We must congratulate Willie and all at the Jura Distillery for this fine expression, it is a triumph.